DAVIE, Fla. (AP) — The NFL’s active career rushing leader may still be a starter at age 35. Frank Gore is listed as sharing the No. 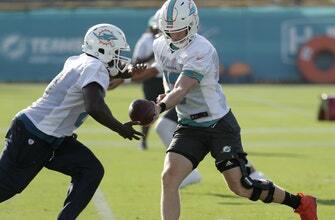 1 running back spot with incumbent Kenyan Drake on the first depth chart of training camp for the Miami Dolphins. Gore signed with his hometown team in March and was widely expected to fill the role of veteran backup. He’s awfully experienced for a feature back, with 13 seasons and 196 games of mileage on him. But that mileage translates into lots of yardage — 14,026 yards, to be exact, which ranks behind only Emmitt Smith, Walter Payton, Barry Sanders and Curtis Martin. And 10 practices into camp, Gore shows no sign he has lost a step.